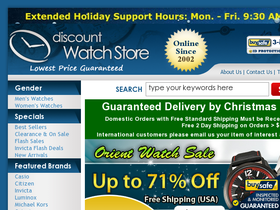 Visit Discount Watch Store online at DiscountWatchStore.com for exceptional service and incredible prices. Browse their collections of Invicta watches, Citizen watches, Orient watches, Luminox watches, Seiko watches, Movado watches, Omega watches, Swiss Legend watches, Jacques Lemans watches, Tag Heuer watches, and many more. Be sure to check back often at 58Coupons.com for the latest Discount Watch Store savings, Discount Watch Store promotions and Discount Watch store coupons. Save an additional 5% on sale items from the Discount Watch Store when you use this code at checkout. Click link to shop. Get 10% off non-sale watches at Discount Watch Store with this coupon code. Click link. Visit the Discount Watch Store today and checkout their daily deals to save up to 85%. Click link to view. Head on over to DiscountWatchStore.com to save $25 on Invicta watches with $199 purchase using this coupon code. Spend $179 on a Seiko watch and receive a $20 discount with this coupon code from Discount Watch Store.